Patrick McGuinness was born in 1968 in Tunisia. In 1998 he won an Eric Gregory Award for poetry from the Society of Authors and his work has appeared in the Independent, PN Review, Poetry Wales, Leviathan and other journals and magazines, as well as the anthology New Poetries II, edited by Michael Schmidt (Carcanet). His first collection, The Canals of Mars, appeared in 2004. Also for Carcanet, McGuinness has translated For Anatole’s Tomb by Stephane Mallarmé from the French and edited the prose and poems of the Welsh modernist poet Lynette Roberts. Jilted City, his second collection, was published by Carcanet in 2010. His novel, The Last Hundred Days (Seren, 2011) was longlisted for the Man Booker Prize 2011, and won Wales Book of the Year 2012 and the 2012 Writers’ Guild Award for Best Fiction Book. 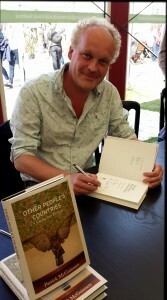 His latest book is a memoir, Other People’s Countries: A Journey into Memory (Cape, 2014). Patrick McGuinness is a fellow of St Anne’s College, University of Oxford, where he lectures in French. In 2009 he was made Chevalier dans l’Ordre des Palmes académiques for services to French culture. In 2011 he was made Chevalier des Artes et des Lettres by the French government. He lives in Caernarfon.